Included with this set is the CalCore Luxury Comfort Memory Foam Back Cushion with Cooling Gel technology. This amazing back support gently contours to the curves of your spine to give you a perfect balance between support and relief. The pad is composed of ultra-responsive memory foam with a high-density cooling gel mid pad for perfect comfort every time. The memory foam back pillow is encased in durable ultra-soft grey velour for an added touch of comfort. Ideal for any office environment, this lower back cushion blends in seamlessly with any office chair and provides exceptional ergonomic relief. 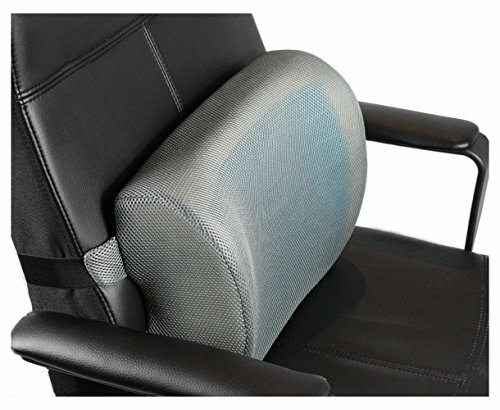 Unlike most other chair cushions, the Luxury Comfort Support is designed with two fully adjustable stay-in-place elastic straps to keep your cushion in place regardless of how many times move from your chair. In addition to your Luxury Comfort Support, this set includes a Mesh Lifetime Comfort back support which is ideal for use while driving and is portable and light enough to use on a train, or plane.The breathable mesh design adds exceptional support to any car seat and provides relief while allowing air to flow freely to your lower back. Regardless of whether you are trying to relieve lower back pain, take pressure away from your coccyx, relax tight back muscles, or improve your posture, or upgrade the ergonomics of your office chair, the CalCore Back Cushion is for you. With the CalCore lifetime money back warranty, you can buy with confidence. NOTE: Memory Foam Soft Velboa version also comes with a bonus Extra Comfort Mesh Lumbar Support for Driving. If you have any questions about this product by CalCore, contact us by completing and submitting the form below. If you are looking for a specif part number, please include it with your message.